Would any moons/rings around either of the gas giants stay intact or get ripped apart by the tidal forces between the two giants? If any moons/rings are able to form around either of the giants, is there a limit to how large a ring system could be, or how far a moon could orbit? It would depend how close the gas giants were too each other, but in theory it would be possible. 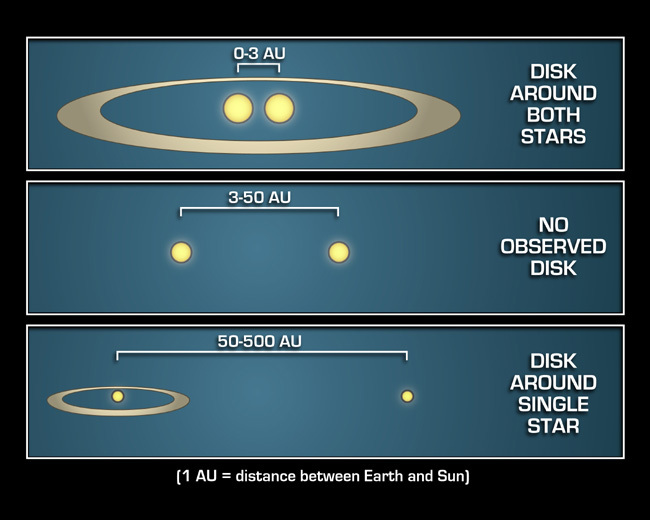 Similar to the binary star system (image below), provided you ignore the AUs and scale this down from stars to planets, the same principal applies to orbits around two gas giants orbiting each other. They would have relatively small hill spheres depending on how close they were and corresponding, even smaller true regions of stability. But planetary ring systems tend to be quite close to the planet anyway and larger ring systems need to be almost exclusively inside the Roche Limit. The binary gas giant orbits would have to be outside each other's respective Roche Limits anyway and provided there was sufficient distance between then, like maybe 4-6 times the larger of the two Roche limits (ballpark guess), then it's possible to have both gas giant planets with their own ring systems. What's not possible is to have two orbiting disks around two bodies where the orbiting disks intersect each other, like they had in the Startrek Discovery premier episode. And that was forming star systems, not gas giants, but it's still impossible for any orbiting ring or debris disk to intersect the way they did it. It was a cool looking image, but clearly impossible. I also want to point out that a ring system around both planets like the top of the first image with the writing "disk around both stars", that's not possible with a typical ring system. Ring systems need to be in tight orbits around their planet, though faint/disburse ring systems like Saturn's E ring can exist further out. The further out a ring system, the more likely it would be disturbed by the binary planet. Do the planetary ring lasts?